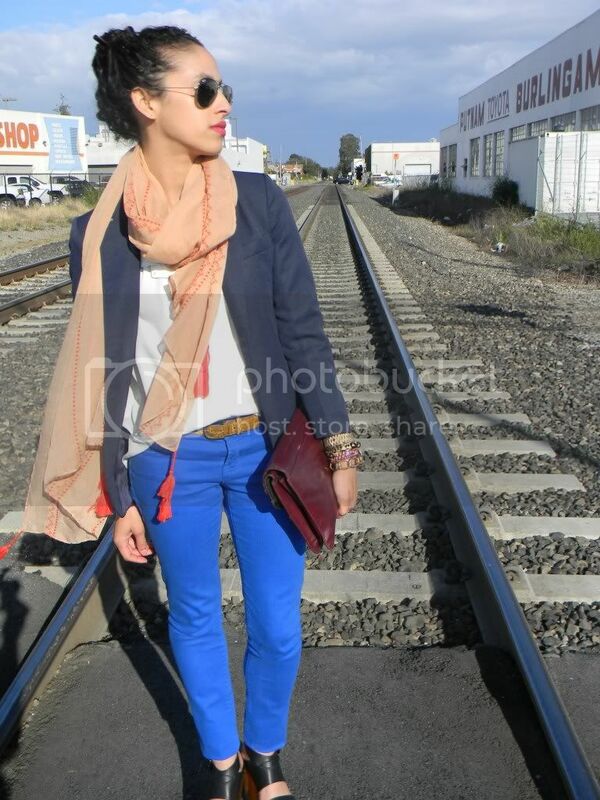 Loving the scarf, the trench, the blue pants!! I'm so jealous of your Real Housewives spotting! And your wedges. And the pants. Seriously, I love this look! looking flyyyyyyyyyyyyyyyy as aslways! ahaha and you totally called the hippie look for our civil ceremony :P ayooo! i just have to dye my hair blonde, and make it into a bee hive and your prophecy will come true..jejejeje. besos! lovee those electric blue pants on you! and you're wearing my fav wedges!! i can't get enough of those steve madden wedges! Loving this ensemble and pop of colour! The shoes are to die for though, like in a massive way! Looks like you had fun fun fun! Great snaps. You look so stylish. I really love those blue pants. the trench coat is fabulous! how do you hear abt all these great events? Love the blue jeans. Fab look. I'm watching real housewives as I write this. I dislike Camille so much. @Courtney Erin: Taylor is so super skinnny, she was wearing these tiny shorts with the majorly hight YSL platforms- and was rail thin! But she did look fab..
@Andee Layne: coming from the best dressed blogger out in SoCal that means a lot! @Brit Greek: where have you been love? your back thats all that matters! @beingdena: ooh there are so many housewives that are just plain crazy!! I love your look. Great pants and wedges. Thanks for following dear, I' m following back. 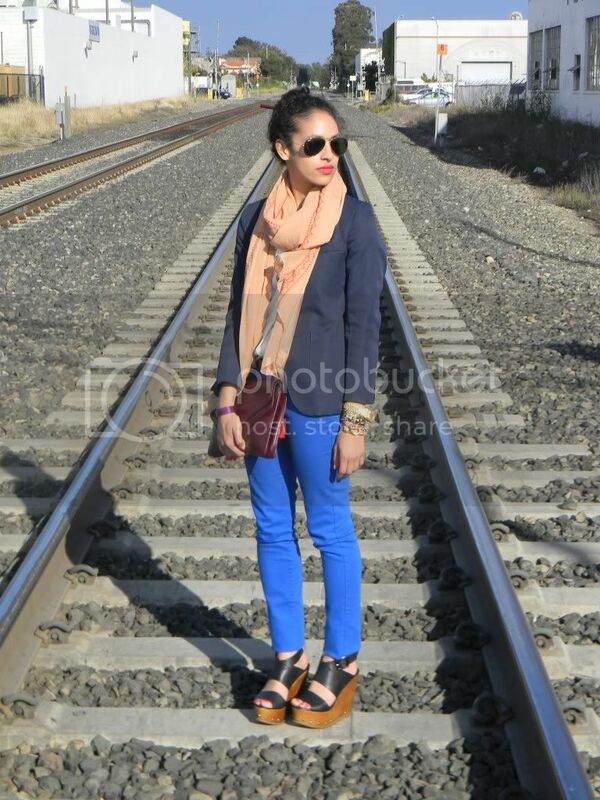 love the bright blue jeans and your shoes, very chic!!! 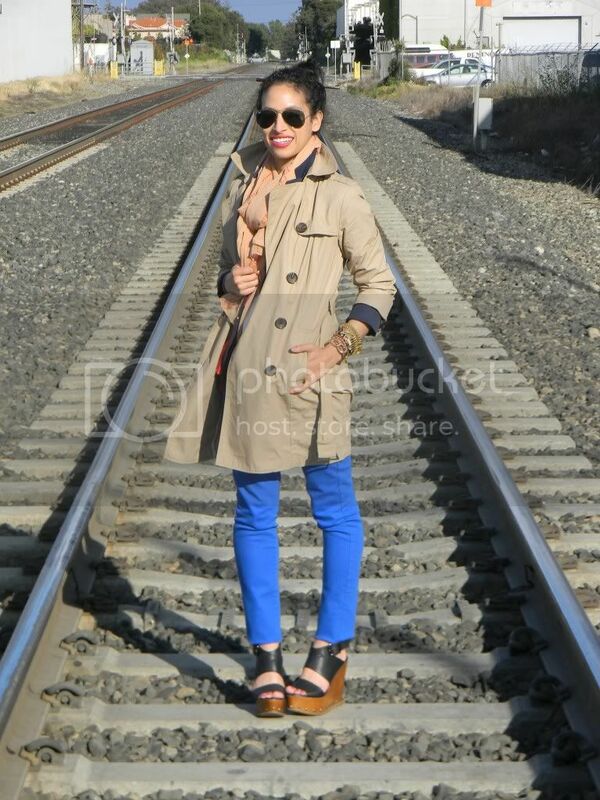 So obsessed with the jeans.. Its still cold enough to wear a trench??? @ Allergic to Vanilla: Yeah me too, when I'm buying something, it has to have great pigmentation. I've tried YSL Voulpté in ''02 Sensual Silk'' once and I absolutely love it! It stays on for many hours and it feels super-silky on your lips. great photos love the pants! and luckily there are never any bike rides but if i new i would definitely go on bike rides with the boyfriend or sister so i should learn just hope i don't get injured! Loving this outfit, those blue pants are awesome. Can't believe you say the housewife lady! Those wedges are insane. Love your scarf too. love the pants and scarf....both of you look beautiful. Such a preppy look I love it. 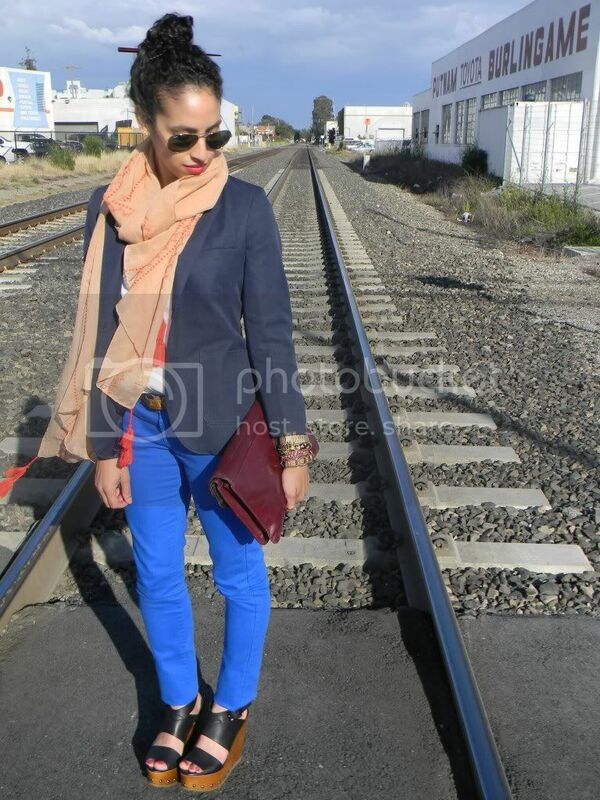 i love colored denim, and this electric blue is just fabulous! i'm looking for some green ones! Beautiful pants...I love them and your outfit!!! omg looks like such a fun time! 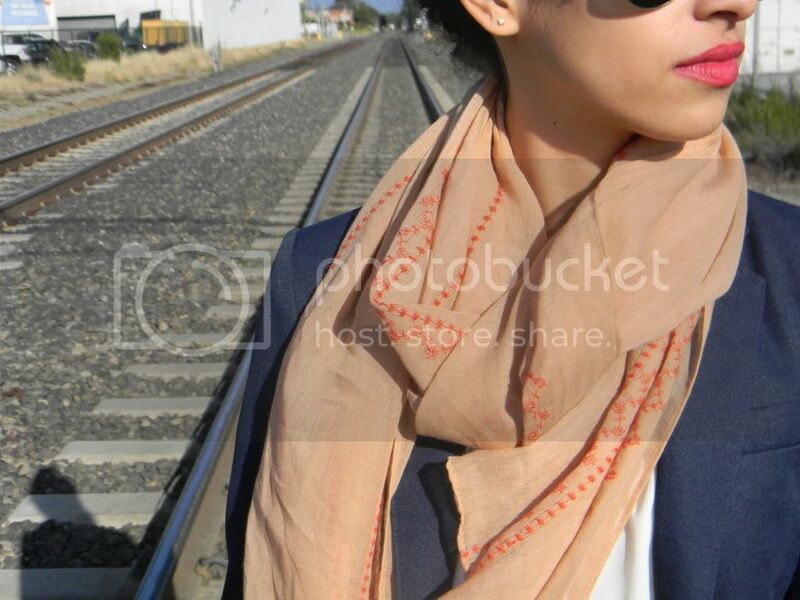 Loving the mix of shades of blues...and that orange scarf is beautiful! Looking chic as always. PS...how cool you spotted a Bev Hills housewife...I am obsessed w those shows...they are ALL such trainwrecks, lol. awe i love this outfit! great colors!